Salifest is booked for next year, the 24.September 2016. 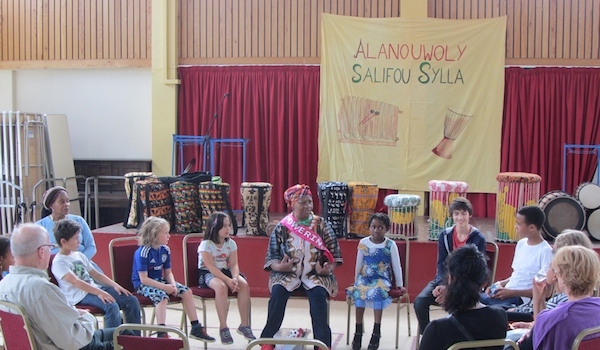 Badenha Foli, a Brazilian family drumming group who are touring Europe, held a drumming workshop. Elsa from LEMP (Lewisham Ethnic Minority Partnership) put on a story telling workshop with a Caribbean flavour. I was so happy to announce that Guinea was celebrating the end of Ebola on the same day! We fundraised with cooked meals, beverages and home-baked cakes and a stall with donated items. The proceeds will assist our Guinean partners to develop the IT and sewing training at the Alanouwaly Community Centre. Both LEMP and Alanouwaly displayed information and photos about work here and in Africa and there was handmade jewellery on offer by a local crafts person. There was a children’s corner to get creative with Lego and some crafts activities. In the afternoon we had performances by LETSwing, a band playing many classic tunes from Jazz, Blues to Motown with a Marlene Dietrich Song put in for good measures. 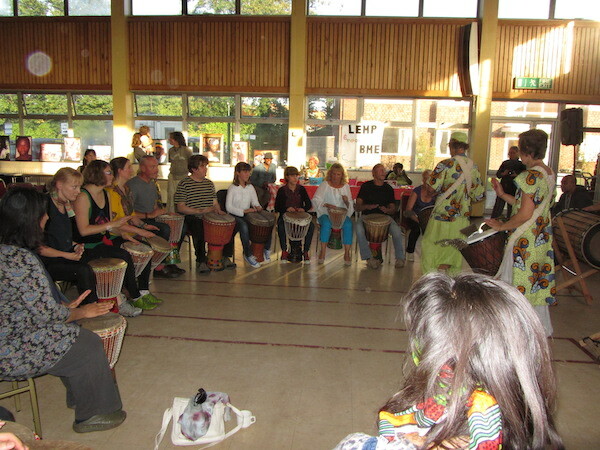 The day culminated in Badenha Foli performing Guinean Rhythms and songs to dance to with many people joining the drumming for their last number. Salifest succeeded in joining people of many nationalities and cultures to put on a happy celebration together! With people asking for more to come!